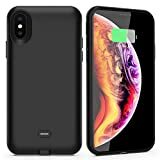 Huge Amazon mistake gets you a $40 iPhone X battery case for $5 if you hurry! Every once in a while you come across a deal on Amazon that’s so good that it has to be a mistake. If you’re lucky, however, Amazon will make good on the deal. We certainly hope that’s the case with a deal we just found, because it’s nuts. If you buy an Alclap iPhone X Battery Case with Qi Wireless Charging right now and use the coupon code CJNY4RFY when you check out, you’ll get this terrific iPhone X battery case for just $5. Seriously… $5! It retails for $40, which is already a phenomenal price for a case that doubles your iPhone X’s battery life and supports wireless charging. At $5, this is totally a no-brainer. Just hurry before Amazon figures out what’s going on and fixes it, which is bound to happen pretty quickly now that the cat’s out of the bag. 【Qi WIRELESS CHARGING】: This iPhone X battery case can work with any wireless charging pad to charge both the phone and the battery case together. It’s fully compatible with Qi and other wireless systems, and no cables are needed for charging. 【ADVANCED SYNC-THROUGH TECHNOLOGY】: You can sync your iPhone X /10 to Macbook, PC or laptop even without removing the case. ★★ Compatible with lightning headphone also. 【POWER to iPhone X】: The 3000mAh extended battery case can effectively provide 80% extra battery life to iPhone X. Enjoy more talk time, music, movies, and internet surfing. No worry about no electricity with your iPhone X/10 when traveling & outdoor camping. 【FULL EDGE PROTECTION】: The soft-shell frame and rubberised support pads of the iphone x battery case perfectly cradles the curved back of the iPhone X,providing edge-to-edge protection from daily wear and tear of the device. ★★★【100% MONEY BACK GUARANTEE】: If there is any quality problem on our iPhone X /10 charging case, please let us know and you will be offered a full refund or replacement. Enjoy this absolutely RISK FREE purchase by clicking the yellow Add to Cart button. 【PACKAGE INCLUDE】: 1-Pack 3000mAh iPhone X /10 Battery Case,Micro USB Cable, User book, WARRANTY CARD.